Here's your ticket to the Hall of Fame. In a world of deadbeat dads and drifting kids, simply being there can make you seem like a standout. But that won't get your children to adulthood in one piece physically, socially, spiritually, and emotionally. That takes a special father-one exactly like you. Championship fathers aren't perfect. They just keep practicing the three fundamentals of being an effective dad: loving, coaching, and modeling. That takes a game plan, and Carey Casey's got it. Using a lifetime of heart-touching personal stories and revealing research from the National Center for Fathering, he'll "school you up" on the most important-and rewarding-position you'll ever play. Whether you're a fatherhood rookie or a field-battered veteran, this practical, inspiring guide will turn the business of being a dad into one of your greatest pleasures. Joining the Championship Fathering team will change your whole family-and maybe even generations to come. Championship Fathering by Carey Casey; Neil Wilson; Tony Dungy was published by Tyndale House Publishers in December 2009 and is our 49607th best seller. The ISBN for Championship Fathering is 9781589975347. 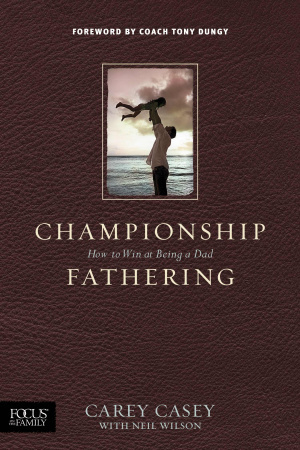 Be the first to review Championship Fathering! Got a question? No problem! Just click here to ask us about Championship Fathering.